With this month's newsletter, we bring you part two of the survey results in which you and your fellow albertapatients members weigh in on causes of (and concerns about) waiting for health care. I am always fascinated by the insights you provide. Your perspective has a much more real-patient, real-person focus than what is often seen in surveys about health care. In addition to waiting for care, there are two topics that albertapatients members asked to discuss in this first half of 2016. First is seniors' care in our aging society, the effectiveness of the current system for individuals and families, and possible solutions for the future. The second topic is the emergency department (ED): How are we using the ED? Why do patients wait there? How does triage work? What are the solutions for improvement? We'd love to know which of these two topics you'd like to discuss next! To indicate your choice, please click one of the links above before May 13, 2016. P.S. Next month, we will bring you some new survey results on a topic that the community asked to explore: Physician Assisted Death. I think you'll find the results very interesting and enlightening, so watch for your May newsletter! Recently, we asked albertapatients members about their experiences with waiting for health care in Alberta. We provided some highlights from the first half of that survey in our previous newsletter (now available on albertapatients.ca), and results from the second half are featured in the Did You Know section, below. • Simply log in to our website at http://www.albertapatients.ca/, look for the Refer a Friend box on the right side of your screen, and click the “More Info” link to tell others about us through email or on social media. Wait times: Patient views on causes, solutions, and priorities. Did you know? Patients feel that wait times are driven by a combination of factors. 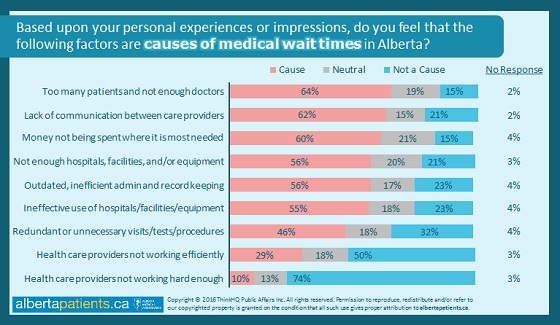 Generally speaking, patients agree that volume is the biggest cause of medical wait times in Alberta – too many patients and not enough doctors to care for them (64%) – but they also believe that the system could be more efficient in terms of coordination and communication, and spending could be more effectively addressing waits.​ When asked to suggest other factors contributing to wait times, 12% of respondents expressed concern about system abuse and a lack of patient education/prevention. Improving communication between care providers is the most strongly supported approach to reduce medical wait times. 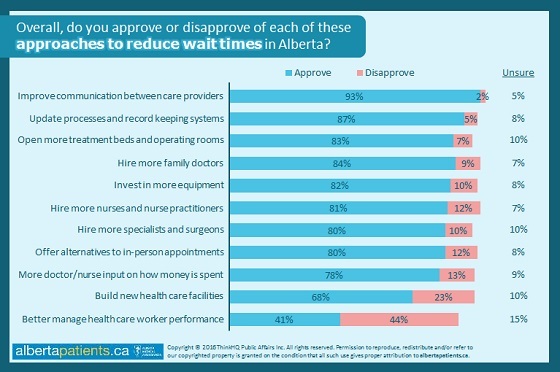 More than 9 in 10 patients support improving communication as an approach to reduce wait times in Alberta, followed closely by updating processes and record keeping systems (87% approval). There is also strong support for funding more treatment beds/operating rooms and equipment (83% and 82% approval, respectively) and hiring more family doctors, nurses/nurse practitioners and specialists/surgeons (84%, 81% and 80% approval, respectively). When asked for other approaches to reduce wait times, 11% of respondents suggested improving the efficiency of clinic and facility booking systems. Timely access is the priority for a majority of patients. 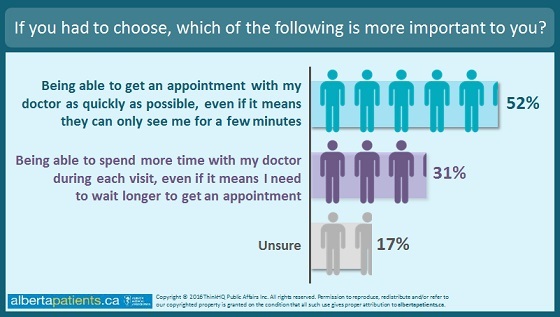 When asked to prioritize timely access vs. time spent with a physician, over half of Alberta patients say that getting an appointment as quickly as possible is the priority for them, even if that appointment only lasts a few minutes. Meanwhile, 31% say they would like to be able to spend more time with their doctor, even if that meant it might take longer to get the appointment. 17% were unsure and many noted that their preference would be influenced by the nature of the health concern requiring treatment. ​Please share it with us! You are receiving this periodic newsletter after having registered with albertapatients. If you have decided you would no longer like to receive mailings from albertapatients and our partners, click the unsubscribe link below.